After a 5 year absence the PWA are delighted to announce that the World’s best freestylers - both male and female - will be returning to the pristine waters of Bonaire between 9th-13th April for the opening Freestyle battle of the year - FORSA PWA World Cup - which promises to be an extremely explosive affair. Bonaire has risen to global fame as one of the best windsurfing spots in the world thanks to it’s reliable trade winds, stunning turquoise waters and of course its laid back Caribbean vibe, while home grown talents such as the legendary Frans Brother’s, former world champion - Kiri Thode (Severne / Severne) - Youp Schmit (I-99 / Avanti) and current world title hopeful - Amado Vrieswijk (JP / Severne) - are just some examples of the world class talent that Bonaire has produced. Event Organiser Nancy Vrieswijk-Janssen: “With hard work wishes do come true!! After almost 3 years of lobbying to get the PWA-scene back to Bonaire I'm thankful I got in touch with Mick Schmit in October 2017. Due to his awesome cooperation and input , the Forsa Foundation and our super motivated committee we can welcome the PWA-crew and international top-riders back to our island this April. Bonaire's license-plates may feature the slogan "diver's paradise, but for sure it is a "windsurfers-paradise" as well. Sorobon and Lac Bay are a mecca for windsurfing and is one of the most picturesque places in the Caribbean as it offers the best recipe of wind, water and weather. The reason why windsurfers worldwide are so attracted to this special place and the breeding ground of our many Bonairian windsurf-talents. The FORSA PWA World Cup Freestyle will be an awesome event as our main goal is to involve our youth. Our pro-riders are role models for many youngsters on Bonaire, and to have the entire PWA pro-fleet in action will for sure have a massive positive impact. How these pros or sports in general can have an impact in the lives of these young people will be explained by Mick, chairman of the FORSA PWA-committee and developer of the FORSA method . "Mick Schmit: Forsa is a group-oriented educational method that is used for young people with behavioural problems. This method is also applied outside the youth care. We do this by organising activities with other organisations or companies in which the element "we" is the focus-point. We emphasise what can be achieved, cooperate, trust and give responsibility. To ensure that everyone feels part of the whole." In addition to the first PWA event of the 2019 season and youth, emphasis is placed on the environment as Bonaire is a Marine Parc. Therefore we urge all visitors to keep our sea and beaches clean. During day time the freestyle-action and activities for primary school kids are at Sorobon and the evening entertainment will take place in Kralendijk at Islander so everybody has easy access to enjoy the competition and festivities. If you're not on Bonaire... no problem… we will have livestream broadcasting with Ben Proffitt (Simmer) behind the mic to entertain you wherever you are. Last, but not at all the least, it is of great importance to mention the fantastic support we have received by the Dutch Ministry of Health, Welfare and Sports which aims to promote the sport and movement on the island among the youth along with all other local sponsors . 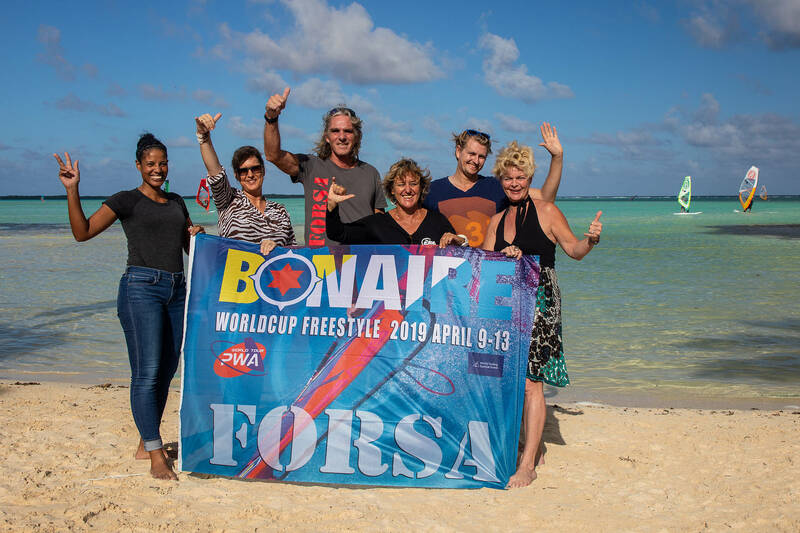 We are proud to show the world that with joined forces our island can accomplish a big event such as the FORSA PWA World Cup Freestyle within our relatively small community. Taty Frans (Point-7): “It’s amazing that the organisers/Forsa have pulled this off and it felt like forever but here we are with another PWA Freestyle World Cup on Bonaire and to start the season at home is wonderful. Forsa made it possible and this will give the locals a good chance for good results, Kiri [Thode] is back and Bjorn Saragoza would most probably also be competing so it will be a good battle for the podium. The 2019 FORSA Bonaire PWA World Cup is now little over a month away… make sure you stay tuned to www.pwaworldtour.com between the 9th-13th April - here you’ll be able to stay up to date with all the latest developments from Bonaire — including elimination ladders, entry list, images, live ticker and of course the live stream, so even if you aren’t fortunate enough to be in Bonaire you’ll still be able to watch all of the explosive action as it happens and it promises to be a show you don't want to miss! You can see the event promo video 'We Present' @ https://youtu.be/iP9qxKQ4aMQ to whet your appetite for the event.